Mac Client Development has begun. https://github.com/Stouse49/goldcoin/releases/download/v0.7.5.0-mac-qt4/GoldCoin-Qt-10.7-10.8.dmg - Now supports MacOS 10.7 and above. https://github.com/Stouse49/goldcoin/releases/download/v0.7.5.0-mac-qt5/GoldCoin-Qt-10.12.dmg - Supports MacOS 10.9 and above. Branches: macOS-qt5 is for 10.9 and above, while macOS-qt4.8 is for 10.7 and above. 2. Second Client (tested below) did run, but was missing QR Code support. 3. Third Client (tested even further below) did run. 5. Mac OS 10.7 support added. 1. Startup after syncing the blockchain is very slow. Application will appear to not be responding. Thank you Eric for the experimental MAC client and to Dr. G. for his help in testing. I'll work to round up some additional wallet testers throughout the week. I updated the Application for Mac in the link in the first post. It will solve the problem documented here. I think I figured it all out. 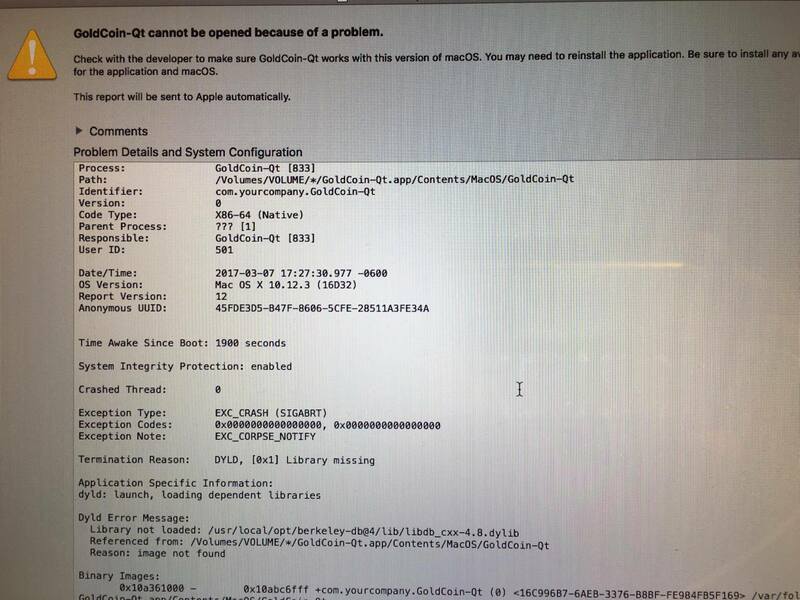 Was able to build Goldcoin and Bitcoin on OSX 10.12. I'm happy because we now have it on my Mac Pro- Awesome. Thank you Eric, must send you some Gold Coins for this. Next the iPhone. The mac client does eventually sync. Sometimes doesn't start, need to delete blockchain files and it works. Not sure if this is due to my testing or if its normal behavior for this client. 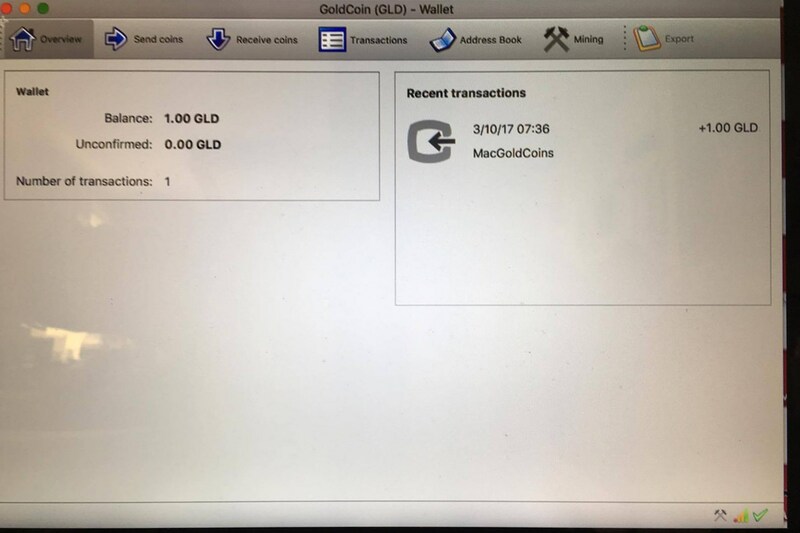 Finally after continuous relentlessness determination my Goldcoin Mac wallet has synced and received a coin. Yes it works. 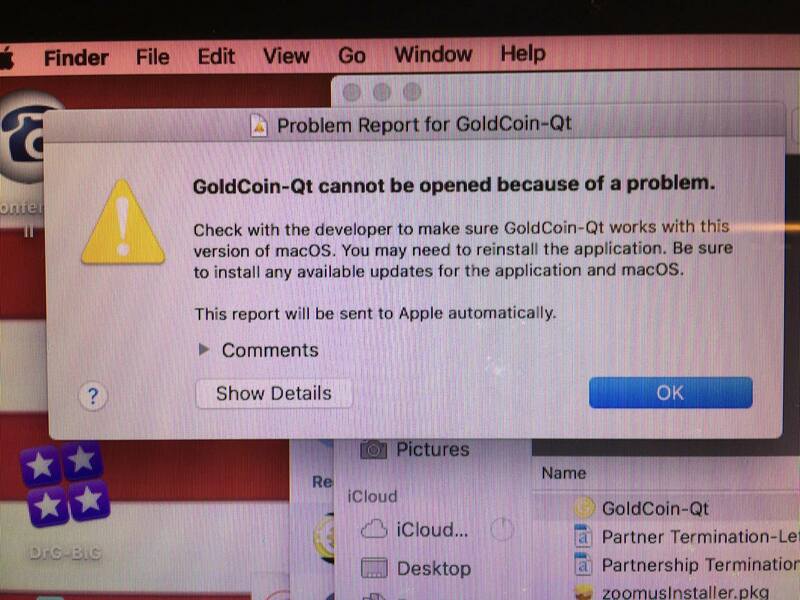 I have installed the GoldCoin Mac Client and had very little hassles the whole time. The installation is pretty quick and smooth! Once installed my only issue was opening it. It usually needs a bit of time to load properly. Once in I did two test transactions, receiving 100 GLD's and sending 80 GLD's and both these transactions were super fast and clean! For the testers we need to know which version of MacOS you have. This was build on a 10.12 machine and may not work on previous versions. I am looking into building this for previous versions and we can test if it works on the current version at that time. I am currently running MacOS Sierra 10.12.3. I had to upgrade it to Sierra because I was running a old version and it wouldn't work. What was your previous version of MacOS? The application claims, according to otool -l, that the min MacOS version that this will run on is 10.9. I was previously running 10.11.4. 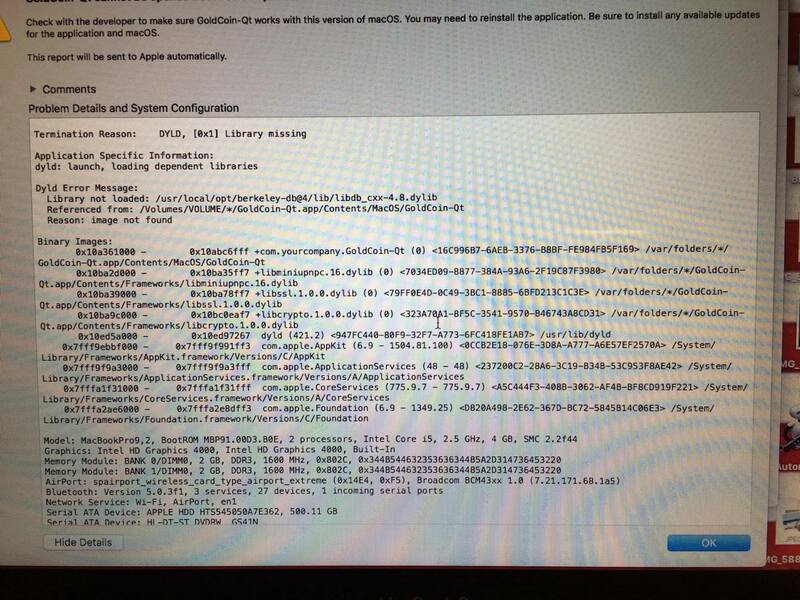 I was told prior to installing it I had to be running OS X 10.12 to test the wallet so I can't recall if I actually tried installing it and it didn't work or if I upgraded my MacOS version before installing it. Continuous - Thank you for the information. The next step is to try to build this application for 10.6. The bitcoin Core software was built for 10.6 (the one available from the bitcoin.org site). Looks like I can make a build for 10.9 and above. Getting it to work with 10.6 is proving to be a challenge. Here is a report on the Mac Client. I tried real hard to build a version of the Mac Client that could run on MacOS 10.6, but was not able to using my 10.12 system. Now the Mac Client that I have built was made to work on 10.9 and above. So far all of the testing (3 people) has been on 10.12. There might be away using a virtual machine with MacOS 10.6, but that will be a challenge in itself -- to get a virtual machine running with MacOS. That is why I bought a Mac Mini, so I would not have to hack and hack to get a virtual machine to run. According to the site: https://www.netmarketshare.com/operating-system-market-share.aspx?qprid=10&qpcustomd=0&qpsp=2016&qpnp=2&qptimeframe=Y, Most Mac users have 10.9 and above. Perhaps we are good with that. We need more tests results though to prove that it works.